I pretty much fell off the reading wagon towards the last quarter of this year. It wasn’t that I didn’t read at all; I did, but I focused on pleasure reading, not analysis or review. I also read some draft works by friends, which aren’t ready for public review. 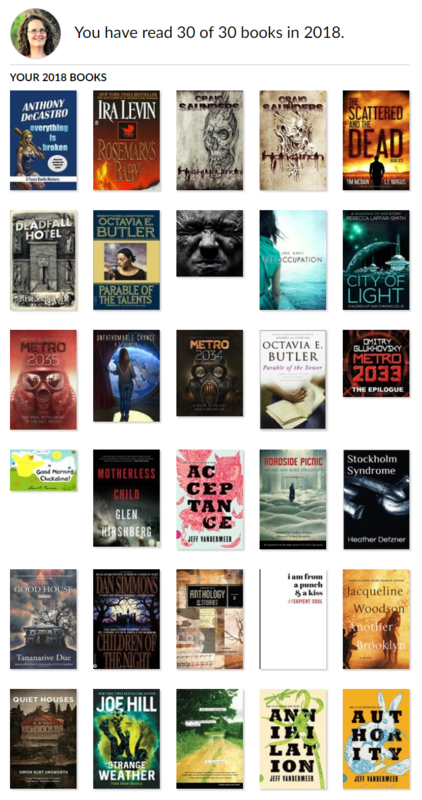 So, while my 30-book list must seem dreadfully light, it’s also not a complete list. You can see some of this reflected in my reading list for the year, which included some Russian speculative fiction including Arkady and Boris Strugatsky’s Roadside Picnic, and the final two books (plus “bridge” novella) in Dmitri Glukhovsky’s METRO series. This post is to talk a little bit about books I read but didn’t review in the second half of the year. The direction both of these books took… surprised me, particularly after I read a short “bridge” piece between METRO 2033 and 2034 called “The Gospel According to Artyom.” Eager as I was to start 2034, I soon found that it didn’t follow Artyom’s POV; he seems to make a brief appearance towards the end, but most of the story is told through the eyes of Homer, self-appointed Metro scribe, and Sasha, a young girl. Hunter, thought to have been killed, returns as well. And there are entirely new station-communities, like a subnetwork of the original story. Although this story is more heavily philosophical than 2033, it is about the fight to remain human even as humanity itself appears to be on the brink of oblivion. In that regard, it’s a good read in its own right, and indeed appears to work together with 2033 to set up the events of 2035. In turn, I found METRO 2035, even with the return of Artyom together with Homer, not as tightly written as 2033 and harder to read. Long pages of dialogue without action or much context gave the book somewhat of a “draft” feel. However, there are some good twists and turns as Artyom leaves the tunnels for the surface, making new friends and meeting old ones. The payoff towards the end was a good one, and the dialogue offered good insights about where society (in both East and West, and in between) currently finds itself. It might appear silly to read only the first two books of a trilogy, but really, the third hasn’t been published yet. The author has hinted that the third is coming this year, but he’s been working on other projects. I’m glad to hear this, because the first two books created a solid world and characters I definitely want to spend more time with. I picked up the first in the series, Hangman, as a freebie download from Amazon. I was soon pleasantly surprised. Reminiscent of what The Shining might have been about had Stephen King dispensed with limits, this thoroughly creepy English folk horror novel has some nasty surprises that keep you guessing to the end. Although there are a few spots that I wish had been more detailed, that’s more because the world Saunders created was so compelling that I wanted to spend more time in it (so I was glad to see it’s part of a trilogy). I also appreciated the social subtext; this is a story for the times we find ourselves in. Highwayman made for a strong follow-up; in some ways I liked this book better than the first. There are some good twists, and the Green Man along with Sam and William makes another satisfying appearance in this story. Love and sacrifice, grief and peace are all themes throughout, and there’s some great imagery. A really solid offering that makes me eager for Coachman, last in the series! I had never heard of Steve Rasnic Tem before picking up a copy of Deadfall Hotel, but around October I was looking for a somewhat short, creepy read, and this story delivered with no shortage of creeping dread. About 2/3 of the way through I found myself actually feeling sad that the book was going to end, because I wanted to spend more time in its world! I follow Tananarive Due on Twitter, which is where I first learned of her. Her commentary on race and other social issues is direct and eye-opening, so when I saw her name and book made BookRiot’s list of 50 Must-Read Contemporary Horror Novels, I purchased a copy. Reviewers who complained that there was too much detail must not have learned how to savor the slow build of a suspenseful novel. This is the whole point of suspense, and Due is excellent at demonstrating the calm before the storm, the quiet, cherished moments in life just before the truly horrifying events come to pass. What makes it work this way: the character detail. Due spends deep time in each character’s head, including the “bad guys,” moving easily between present-day and the past events that offer context, meaning, and forward motion to the storyline. Also refreshing: the way Due depicts voodoo. I admit I enjoyed the movie “Skeleton Key,” but even that movie, with its storyline grounded in a slave tragedy, made voodoo look a lot more sinister than it really is. My own research for a short story I wrote taught me that the voodoo religion is grounded in Yoruba traditions, and it’s that faith — including a reliance on ancestral guides — which the book draws upon as the characters fight the demonic presence trying to destroy their lives. The entire book is a great example of what authors of color mean when they say “representation matters”: its religion, characters, and situations are grounded in a culture and experience overlooked and rejected by whites. Probably one of my formative authors, as both a writer and a human, was Madeleine L’Engle. I enjoyed the way she deftly handled the spiritual within the science fiction (really, across all her novels), even if her characters (like their creator) enjoyed privileges of money and status that I didn’t have. It was fascinating to me, then, to realize that given my interest, no one had ever suggested to me to read Octavia Butler. Whether none of my white teachers even knew of her, or didn’t think the subject of a young girl founding her own religion was appropriate, or simply that her writings would be relatable, is something I’ll never know. In any case, and especially after reading her Parables, I felt like never having heard of her until well into my 40s seemed just criminal. A chillingly prescient (especially for 1993) story that goes into meticulous detail about the realities of what it might take to survive on the road, I couldn’t help feeling that The Parable of the Sower makes “The Walking Dead” seem cartoonish in comparison. The dangers in this book are all too real; their understatement adds to their menace, if only because POV character Lauren takes them as a matter of course. In many ways this book seems allegorical to historical events such as the burning of Tulsa or the demolition of Seneca Village by whites, and in that regard, is a must-read. Moving on to The Parable of the Talents, I found that it was hard to read and not think of Butler as a prophet. Yet, the signs of the future society she depicted — climate change and all — were present in 1998. The result, set only a few short years into our future, is searing and chilling all at once. Her description of “the kind of solutions that people reach for when they are desperate, when they are frightened, when they are looking around” demonstrates human nature and our propensity for discrimination and cruelty, which comes down to the control (or desire for control) that stems from our insecurity over whether we’re on the right path. We can never seem to let others follow their own path. Whether this is part of our social survival instinct as a species, or has a darker motive — winnowing people who can’t or won’t live as part of our “pack” — Butler’s observations lay bare our supremacist systems as well as our own delusions about what they really are. My final read for the year was a short novel by a local author that I picked up at an indie bookstore event where we were both signing books. Tony DeCastro and I are members of the same writers’ group, and it was with pleasure that I was able to support both a fellow local writer and a local indie bookstore. Everything is Broken is a solid debut with great pacing that hits all the right genre notes for pulp crime fiction. Off-season Myrtle Beach is its own seedy character, and its denizens are those we all seem to meet in every tourist town. There’s some good commentary on the underbelly of college sports and how it capitalizes on (and feeds) the cycle of social desperation, and while I wished for more a little more depth to the women in this story (in the vein of Dennis Lehane’s Angie Gennaro or James Lee Burke’s Helen Soileau), the overall story hung together very well. I’m looking forward to future additions to these series — including the second in the series, due out this month. This coming year, the plan is to get through my staggeringly backlogged TBR pile both print and electronic. Naturally this will mean achieving a better balance between foreign language (and other *cough*Haunting of Hill House*cough*) television, but with books like Sergei Lukyanenko’s Nightwatch series and a good bit of Crystal Lake Publishing’s backlist (thanks to backing their Indiegogo campaign), I’m up for the challenge. I have to giggle — I saw you post something not long ago about watching Danish TV and assumed you meant this one! 🙂 I really liked it and so did my 12yo, it’s very thoughtfully made. Does follow a theme though — youth struggling in the world their parents have made for them….